The first ever Genocide Memorial day to be held simultaneously across European capitals has been hailed a runaway success. 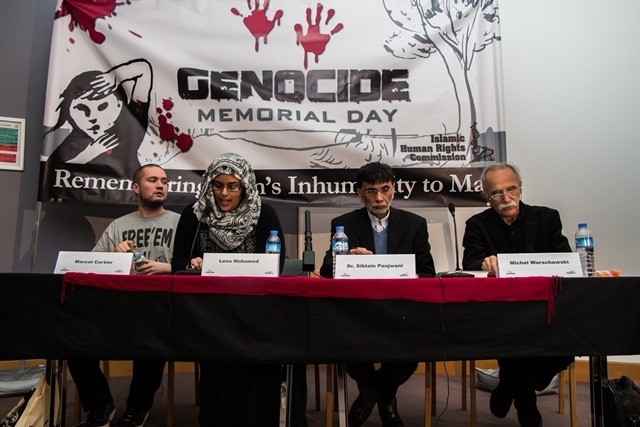 Around 150 people showed up in London Sunday to commemorate the event and listen to speakers highlight, amongst other things, the plight of Palestinian prisoners and the continuing oppression of the Palestinian people. A live link-up with the GMD gathering in Paris discussed the possibility of widening the boycott of companies which trade with Israel in order to apply additional pressure on the Zionist regime. A boycott of products from the occupied West Bank has already been successful in significantly cutting back the trade companies inside the EU do with settler companies. The GMD commemoration in Amsterdam announced that it would ramp up efforts to raise awareness about the impact of Dutch slavery later this year. Organisers and participants said they believed that Dutch society suffered from a deep ignoranc about their country’s huge part in the slave trade, which was responsible for the deaths and suffering of hundreds of thousands of Africans, Indians and East Indians. One of the ideas under consideration is demonstrations and events to oppose the Netherlands’ annual “Sinterklaas” or Santa Claus festival, central to which is the racist Black Pete character. Although the festival harks back to the 1600s, Black Pete, who is Santa Claus’ little helper, only emerged as a character in the 1800’s when the slave trade was in full flow. During the festival celeberations, Dutch people blacken their faces to mimic Black Pete in what anti-racism campaigners view as an odious reference to colonialism. The IHRC will look into the possibility of holding concurrent events in London to coincide with the Dutch events. Another boost was the enthusiasm of one of the key speakers in London, Tjanara Goreng Goreng, to explore the possibility of raising the GMD flag in Australia. Goreng Goreng, who is an Assistant Professor of Indigenous Studies at the University of Canberra and who spoke on the Genocide of the native people of Australia, said she would be interested in planning events in her homeland. 1. Established in 2010, Genocide Memorial Day is a day focused on remembering man’s inhumanity to man. The remembrance is not limited by the background of either the victims of the genocides or the perpetrators of any of the genocides. It rejects the notion that there is a hierarchy of victim depending on their background. More importantly, IHRC aims to highlight the processes that lead to genocides and genocidal acts so as to flag up the potential for future crises. 2. More photos of the event can be found here. Contact the press office for hi res versions and permission to use.